This set of 14 stamps is in my humble opinion, quite possibly the most beautiful set of stamps ever produced during the classic period from any country in the world. John Cabot was the explorer who discovered Newfoundland. This set was issued on June 24, 1897 to commemorate the discovery. A pristine mint set retails for just over $400, which is a mere pittance compared to what other long commemorative sets from this period typically sell for. The set was printed by the American Bank Note Company and interestingly, rather than place their imprint in the margins of the sheets, they engraved them right onto the individual subjects of the plate in the bottom margins. Although it is a fairly simple set, with few to no varieties listed in the Unitrade Catalogue, I would submit that the reason for the low number of listings has more to do with a lack of attention being paid by philatelists in conducting in depth studies of the set. I think that many more collectible varieties would come to light if serious philatelists would study the set in detail. The above list is short and manageable for someone who wants to form a specialized, focused collection of some very beautiful stamps. I have not seen any significant shade varieties to speak of on the issued stamps, although I understand that the 12c plate proof exists in both dark blue and slate blue. Also, there are no perforation or watermark varieties to distract you. In terms of papers, I have seen two main types: a soft wove paper that either has horiziontal or vertical mesh and measuring between 0.0035" and 0.0045"., and an oily paper of equal thickness that has no obvious mesh pattern. Unitrade only lists this scarce paper type on the 1c, though I'm sure it probably does exist on some of the other values as well. The gum on this issue is a smooth deep yellowish cream that often has stippling in it. I have noticed that usually the vertical stamps are found on horizontal wove paper, but I have seen the horizontal designs on both vertical and horizontal wove paper. This leads me to believe that all values probably do exist on both horizontal and vertical wove paper. As this was an engraved set, there are bound to be misplaced entries and re-entries to be found. I have seen some examples of the 1c that have circular dots in the left "1". Unitrade lists a major misplaced entry on the 12c in which some of the horizontal shading lines from the upper left spandrel appear in the left margin. There is also a major re-entry listed for the 2c in which the 2's and most of the lower letters show some doubling. I'm sure there are others just waiting to be found in the other values. Plate proofs exist of all values and are all very affordable, providing the specialist with an opportunity to acquire large blocks. I have not seen any die proofs ever, but I am certain that they must exist somewhere, as well as some trial colour proofs, as it is unlikely that the American Bank Note Company went with the colours first suggested for each and every value. There had to be some colours that just didn't make the cut. Cancellations on these stamps are usually just a mute circular barred grid, but occasionally, you can find split ring town cancellations from various small Newfoundland towns. These are very scarce and highly prized. Wouldn't it be fun to see how many of these small towns you can find? Bisects of some of these issues are also known on cover. Unitrade currently lists them on the 2c, 3c and 6c, though it would be fun to try and find them on the other values as well. I'm not by any means an expert on Newfoundland postage rates, but I suspect that values over 10c from this set are only going to be found on registered covers to far away countries other than the UK. 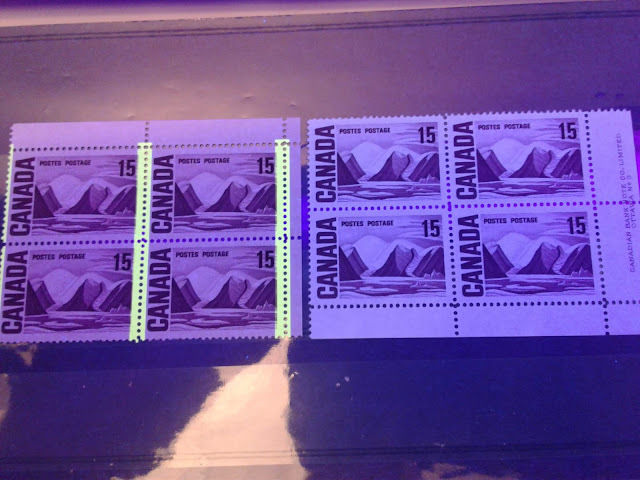 UK covers are probably going to be franked with values between 5c and 10c, while the lower values will be for local Newfoundland mail and covers to Canada and the US. The catalogue prices for covers are all very reasonable considering that I have yet to see any of the higher values used on cover. I suspect that the postal history of this and later Newfoundland issues is quite underpriced, as much of the interest now is still on the earlier Cents issues. So this would be a good set to get into on a specialized basis.